All of the department stores, restaurants, public schools, malls, shopping centers, and businesses of various other sorts are decorated to the hilt, adorned with glorious signs wishing all who read them: “Happy Holidays.” Store clerks, likewise, are (usually) quick to express the same wish to customers. The decorations on display this time of year are just as beautiful as the well wishes that people, including strangers, exchange with one another. To this judgment, only the proverbial “Scrooge” could take exception. Still, the stone-cold truth of the matter is that the “Holiday Season” that pervades our country every year during this time isn’t anything of the sort. There is no “Holiday Season.” …The season in question is what it has always been: the Christmas season. Everyone, Christian and non-Christian alike, must know this to be true — regardless of whether they choose to recognize the Christmas season for what it is or not. It isn’t “holiday” music that we find impossible to escape, regardless of whether we are in our cars or out and about; it is Christmas music — some of the greatest music to have ever been created — to which [we] are routinely subjected day in and day out through the months of November and December. It isn’t “holiday” programming that television stations supply during this time of year. It is Christmas shows in which millions and millions of adults, no less than children, delight. It isn’t “holiday” movies that exponentially boost the film industry during the last month of the year. It is always Christmas-themed movies upon which Hollywood relies in order to increase profits. We may choose to call the enormous tree out front of Rockefeller Center in New York City, or the comparably magisterial tree at the White House, a “Holiday Tree.” But, in fact, we know that they are Christmas trees. We could even decide to change the name of Dickens’ A Christmas Carol to A Holiday Carol, but in the end, there would be no circumventing the unpleasant facts that Dickens’ classic was originally written as a [defense of] Christmas, and that it long ago established itself as a timeless Christmas classic. In short, there would be no “Holiday Season” if not for Christmas. Our culture and our economy — our country — benefit incalculably from the birth of [Jesus] in a manger some 2,000 years ago. In some sense, at some level of consciousness, there is scarcely a soul in America who doesn’t know this. It isn’t, of course, that everyone knows that Jesus of Nazareth was God Incarnate. Nor do I mean to suggest that everyone, or nearly everyone, is aware of the eternal salvation that His birth made possible. Rather, it is the economic, moral, and political rewards accruing from the birth of Jesus of which we all seek to avail ourselves. Most tellingly, it is those who in one way or the other have [brought about] the so-called “War on Christmas” who seem most eager to reap these fruits. Those time-honored practices that mark “the Holiday Season” — the exchanging of gifts, say, and the expression of “good will toward all men” that translates into an increase in charitable giving — have their roots in the traditional Christian account of the birth of Jesus. 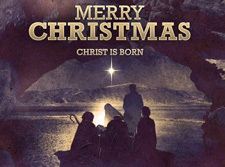 Christmas films, television shows, and songs, even when they exclude explicit references to Christ — think White Christmas and Miracle on 34th Street, Frosty the Snowman, Rudolph the Red-Nosed Reindeer, and even the Public Broadcasting System’s Christmas Eve on Sesame Street — converge around one unmistakably Christian idea: the idea that Christmas is a time for joy and miracles. Jack Kerwick, Ph.D. blogs at Beliefnet.com, “At the Intersection of Faith and Culture,” and The Philosopher’s Fortress at www.jackerwick.com. Contact him at jackk610@verzion.net. This article was first posted at AmericanThinker.com on December 24, 2011. Reprinted here December 13, 2012 for educational purposes only. 1. For each of the following statements made by Mr. Kerwick, write agree or disagree, and explain your answers. 2. Do you think Mr. Kerwick persuades readers to agree with his point of view? Explain your answer. a) Should retailers omit the mention of Christmas in their Christmas sales? Explain your answer. b) Should schools prohibit students from singing Christmas carols, putting up Christmas decorations, etc.? Explain your answer.